Many chief ministers — Naveen Patnaik, Nitish Kumar, Shivraj Chouhan, Narendra Modi — won re-election repeatedly because decent economic policy plus improved governance yielded 9-10% GDP growth for years. If you do the same in UP, you will not only get re-elected but become a strong candidate for the next Prime Minister. You have promised the usual good deeds that all new CMs do, to improve electricity, roads, cities, law and order, education and health. These are important. But you need something special for a breakthrough. Seek an area where UP is already No. 1, and build on that. UP is tops mostly in population, infant deaths, and other negative indicators, reflecting its large size and poor governance. It has some successes. Noida, next to Delhi, has become a hub for IT, media and entertainment. But it’s not India’s best. UP is a successful No. 1 in buffalo meat exports. Such exports have quadrupled since 2010 to overtake basmati rice as India’s top agricultural export. UP also has the most world-class abattoirs certified for quality and sanitary standards by meat-importing countries. These are rare centres of global excellence in a backward state. Buffalo meat is one of a triad of interlinked industries — dairy, meat and leather. The same buffaloes yield all three. They are widely owned already. With the rise of tractors, bullocks (castrated bulls) are not needed for ploughing or bullock carts. Because of UP’s ban on cow slaughter, bullocks and male calves cannot legally be sold to abattoirs. The price of fodder has shot up and grazing grounds have disappeared, so feeding animals is expensive. Hence farmers simply kill, starve or let loose on the roads all male calves, surplus bullocks and cows beyond milk-giving age. But buffaloes are not cows. Their slaughter is entirely legal. 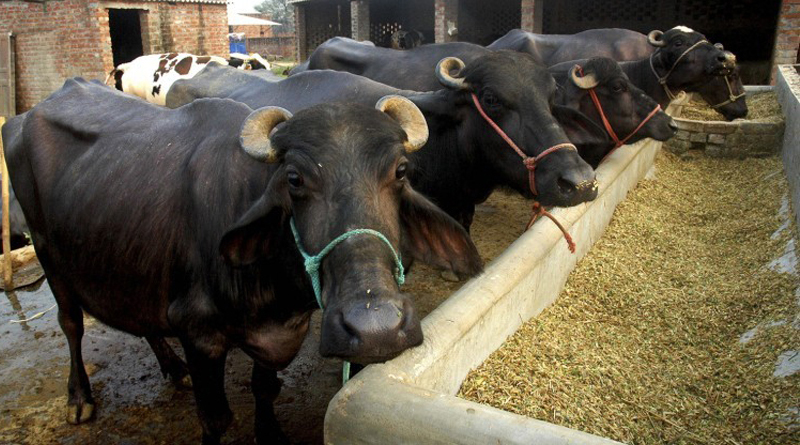 Old cattle fetch nothing but a dry female buffalo or male fetches Rs 25,000. Farmers find buffaloes more profitable than cows, and so UP’s cow/bull population has fallen steadily, while that of buffaloes has shot up and overtaken that of cows. Many male buffalo calves are still slaughtered or starved at birth, wasting half the potential animal wealth. A very modest feeding subsidy for the first year can induce farmers to rear male calves for two years, and then sell them for meat and leather. Buffalo meat exports shot up from $1.15 billion in 2009-10 to $4.78 billion in 2014-15 before declining slightly. The scope for future growth is high. With farm plots getting split between several children, many farms are too small for profitable cropping, causing distress and suicides. One obvious solution is to shift from cropping to buffalo rearing for the triad of milk, meat and leather. That can give productive employment to millions and greatly relieve farm distress. Yogiji, if you want 10% economic growth that ensures your re-election, a vital initiative must be to quadruple UP’s buffalo exports. Then leather and dairy exports (and jobs) can quadruple too. Every municipality and district should, by law, have a slaughterhouse for supplying meat. Don’t just close illegal or polluting ones, create conditions for a boom industry. Outsource decrepit government abattoirs to top exporters, whose foreign clients will insist on pollution-free systems. Foot-and-mouth disease afflicts bovines today. Experts say a Rs 2,000-crore programme can eradicate the disease in three years. That will improve the prices of dairy and meat exports by 30-40%. UP also needs city-wide effluent treatment plants linking all leather producers, ending tannery pollution. Your first aim must be to quadruple buffalo production. With a small feeding subsidy for young male calves, this is entirely possible. Unfortunately gau rakshaks are wreaking havoc. Cattle traders say these rakshaks are really bandits demanding bribes, now up from Rs 350 to Rs 500 per animal. If traders don’t pay, they are beaten, their money is snatched, and the police are called to book them on false charges under the Prevention of Cruelty to Animals Act. The police and gau rakshaks share the loot, even though it cripples what could be UP’s biggest employer and source of prosperity. Yogiji, you must stop this. It has nothing to do with cow protection or the Hindu faith. The cow may be holy but not the buffalo. Quadrupling the buffalo industry is entirely compatible with cow protection. As a Yogi, you know that the bull is Shiva’s steed, while the buffalo is Yama’s steed. You will sneer at any Hindu who cannot distinguish Shiva from Yama. Equally, you must sneer at those that cannot distinguish bulls from buffaloes. ← Can Yogi do more for electricity than gau raksha?